One of the best way to save income tax is to utilize the deduction available under section 80C. The current maximum threshold limit is Rs. 1,50,000 for Individuals and HUF. Various investment options are available for getting deduction under section 80C but every investment have different rate of return and different lock in period. Moreover in some cases the income earned on the 80C investment are subject to tax. 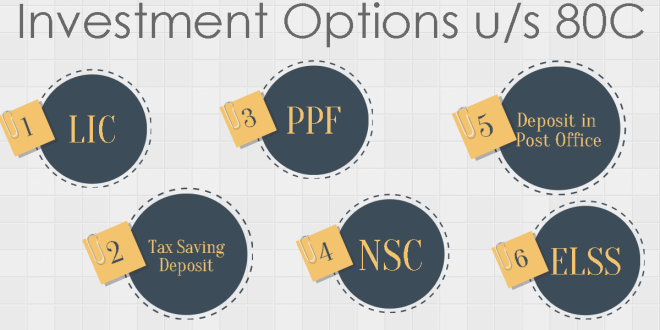 So it is important to consider all these factors before making any tax saving investment. Liquidity – Surrender option is available only after paying premium for three complete year. Receipt – Interest is taxable on due or receipt basis. Principal amount is not taxable. Liquidity – Pre mature withdrawal is available anytime. Liquidity – Full amount can be withdraw only on completing maturity period of 15 year. Partial amount can be withdraw from 7th year onward subject to certain restrictions. For exact calculations, you can use this PPF Withdrawal calculator. Receipt – Interest is exempted under section 80C (subject to limit) on due/receipt basis. Liquidity – Premature encashment is only available in special cases such as death of certificate holder, ordered by court of law etc. Return – Not assured (10% – 20% approx.) It depends on the fund in which investment is made as well as time of making redemption. Rohit Pithisaria is a Practicing Chartered Accountant from Jaipur and been in practice for more than 7 years. He is actively writing from very beginning of his professional career and is author of various tax articles and blogs.